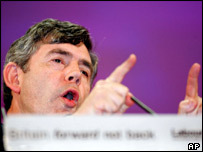 Chancellor Gordon Brown has been reprimanded by the European Commission for breaking targets on borrowing. The UK has borrowed more than the EU's debt limit of 3% of national income for the second year running. The commission fears the UK will continue to break the rules but cannot impose a fine on a non-euro member. It wants EU finance ministers to set a deadline for Mr Brown to cut the UK's deficit. The chancellor continues to insist his plans are affordable. He has often said the European growth and stability pact limit should not be applied too rigidly. UK government borrowing was 3.3% of GDP in 2004/5 and the commission predicts it is likely to stay above the 3% limit in 2005/6 and 2006/7. The commission gave an early warning to Mr Brown last September and is now setting a deadline of the 2006/07 financial year to bring borrowing in line with the EU rules. EU economic and monetary affairs commissioner Joaquin Almunia said the excess debt was close to the limit but was not temporary. "Although the UK budgetary position is less worrying than that of others in the EU, particularly as far as its debt position is concerned, the commission recommends that the UK deficit be declared excessive and the UK asked to correct the situation," he said. There could now be a stand-off when the European Council of Ministers discusses the commission's recommendation. But Mr Almunia told reporters he was confident EU finance ministers would back the plan - and that Mr Brown would agree. "The slippage is not so big as to require a very big package of measures for the adjustment," he said. Mr Almunia said Mr Brown still had to keep his books on a sound footing despite the fact the UK could not be fined for breaking the debt rules. "I do not drive my car properly because I don't want to pay fines, but because I think it is the right thing to do - that applies to budgets as well," he argued. Former UK Cabinet minister Peter Mandelson was among the 25 EU commissioners who approved the reprimand. Mr Brown insists he has stuck by his "golden rule" of borrowing only to invest and balancing the books over the economic cycle. Critics point out that he has changed the dates of the current the economic cycle. The Treasury said in a statement: "As the government set out in the pre-Budget report last month, we continue to meet our fiscal rules over the cycle, with the public finances sustainable and increases in public investment fully affordable. "Over the last year, the UK's current deficit has virtually halved, and is projected to halve again over the coming year." It said the government's projects were in line with a "prudent interpretation" of the rules and the UK had since 1997 enjoyed the lowest average debts of any major European country. Other nations which have broken the growth and stability pact in recent years include Germany, France, and Italy. But Conservative shadow chancellor George Osborne said the commission had simply joined a "chorus of international institutions chastising Brown for his poor handling of the public finances". "And it is hard working families who will have to pay for it with taxes rises," he argued. Liberal Democrat Vince Cable said the warning was embarrassing for Mr Brown. "The argument that he 'continues to meet the fiscal rules over the cycle' is hollow and spurious," said Mr Cable. UKIP MEP John Whittaker said it made no sense for the commission to criticise the UK as it was not part of the eurozone. "It is farcical that the commission should be pointing its finger at Britain," he said.